In August of 2001, Sean and I drove across the country, from Virginia to San Diego. It was magical for me, the way things are magical when you're 21 and in love. And it wasn't just Sean I was in love with, it was America, the whole great mass of it, all of its wild topography and varying terrain, its diner waitresses and roadside peach stands, the ham sandwiches we ate in supermarket parking lots to save money, the sunflowers that grew on the side of the highway in Kansas. A month or two later, I read On The Road—I mean, I actually read it, as opposed to just having it sit there on my shelf while I pretended I had—and I underlined great swathes of it ("Here I was at the end of America—no more land—and now there was nowhere to go but back"), recognizing finally the fearless freedom of the road trip, that distinctly American urge to move, to light out for the territories, to discover. My favorite stop we made on that trip was a place called Pyramid Lake in Nevada. I'd read about it in the tattered USA guidebook we were carrying around—this was before Yelp and TripAdvisor, obviously, so our recommendations for the 50 states were squeezed into 900 pages—and something about the description had appealed to me. We had our camping equipment in the back of the van and we were young and aimless enough to have time to kill, so we pulled off the freeway and followed the signs for Pyramid Lake. We camped on the shore, the only people for miles around. This being pre-Facebook, I documented it the way all earnest twentysomethings documented things back then: in the homemade trip scrapbook. I don't know what it was about Pyramid Lake that made it so memorable, but when I thought about it in the intervening years it was with a warm feeling, the edges blurred and fuzzy, like the whole memory was glowing. When we moved to San Francisco in 2007, we talked about going back—we almost stopped again on our drive out west from Charleston, but this time we had a deadline to meet and a plane to catch—and yet we never did. Like most things, it just became something we talked about idly and never did. We should go back to Pyramid Lake. Oh, we totally should. And then this weekend, eleven years after our first visit, we decided we would. It was an impromptu decision—torture for planners like me—and we gave ourselves very little time to talk each other out of it. On Saturday morning, we gathered our sleeping bags, packed up the car, and left. Four and a half hours later, there we were, back on the same turn-off road to the lake. It came into view sharply, glittering like an emerald. It sounds overwrought enough that you wouldn't believe it if you read it in a novel, but my breath caught in my throat and I gasped. For the first half hour or so, I wondered if we should even have come back. It was crowded this time, swarming with people in big trucks pulling boats, the boats blasting Rhianna and making high-speed laps of the lake. I lamented the lack of solitude; the spot where we'd pitched our tent on the shore eleven years ago was now home to a colony of RVs. We drove further and further north up the shore, looking for a little loneliness. The paved road gave way to a dirt one. We lost all cellphone reception. And finally, miles from anywhere, we found it: a perfect spot to settle. And here, finally, was our solitude. We swam and read and sat on the sand and stared at the view. We climbed a huge rock with two beers in Sean's backpack, and toasted to homecomings as the sun sank lower and the vague imprint of the moon appeared. 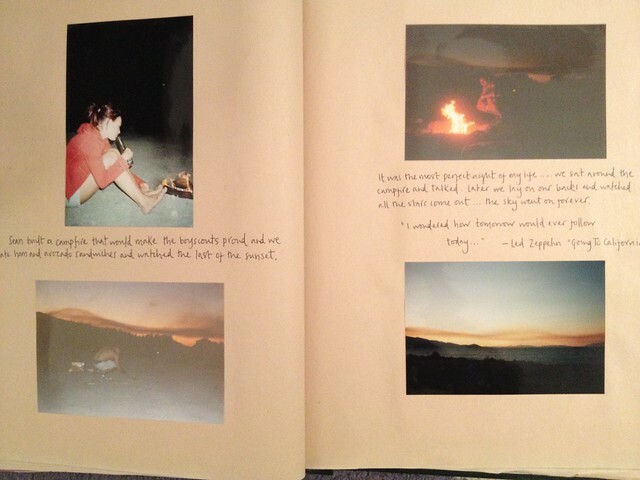 It got a little darker and Sean built a fire, and the tent blew away and we had to look for pebbles to tamp it down, and we grilled sausages over the fire and sat and talked and marveled at how so much had changed in eleven years and so much had stayed the same. Saturday, as it turned out, was the anniversary of the day Sean and I met. I wrote about it last year—about how when we got to this same day next year, I would have known him sixteen years, or exactly half my life—but it didn't even occur to me until the day before we left that the milestone would pass while we were away. It seemed fitting, I think, that it did. So often I think we avoid going back to places that once meant something to us, afraid that something dark might have moved in to cloud our expectations, an ugly blemish creeping over a happy time. I was worried about that with Pyramid Lake, thought perhaps I'd remembered it with the soft perspective of someone young and unformed, someone easily impressed and unsure what she liked, thought perhaps I'd get there and wonder why I'd come. Turns out, though, that I was wrong. On your luckiest days, you can walk straight back into the past like nothing's changed. Tons more photos of Pyramid Lake here. And as much as I would like to keep it all to myself, if you live anywhere near it, you really should go. Let me know if you have any questions about camping there and I'll try to answer them. You two are adorable. I hope you had a happy 'the day we met' anniversary. I met my husband at 18 and we've been together for 13(!) years, it's amazing how much history you can make together. I am so glad I discovered your blog a little while ago. You remind me of myself in many ways with your stories of falling in love at a young idealistic age with a boy named Sean and your nostalgic nature; I married a Sean I met at 19 and much of my head glows with the fuzzy golden hued memories of my life. But the real reason I get excited when I see a new post in my reader is your writing. You have a honest and easy going writing style that is fun to read and this post is a perfect example. This place looks fantastic. Thank you for sharing. My husband and I have a similar special spot of the shores of lake Superior just past Grand Marais, MN. We've been numerous times, but now it's often populated with other people. I'm glad to share a beautiful spot, but also want to keep it all my own. That lake is gorgeous! Looks like such a fun time. Happy 16 years Holly and Sean! Can't wait to see what the next 16 hold for you guys. I love this. This spontaneity is what I wish my husband I shared. And honestly, you've inspired me! I'm so tempted to go home, grab his old tent, kidnap him, and drive. So, thank you - you've given me something to dream about on this boring Tuesday. Beautiful writing...This entry could actually make a camper out of me. I completely agree with the American desire to go on road trips! I drove cross country when I moved from Salt Lake City to Rhode Island four years ago. I did this alone and it was the most amazing experience! Now I get to do it again. Not as far this time, I'm moving from RI to Florida and not alone as my boyfriend is moving with me. I am excited to drive through places I have never driven before though. Yes, I have been to these places but I have never DRIVEN there. Something about seeing the way the country changes before your eyes is magical indeed. Awesome. Camping has to be the most relaxing type of vacation of all. I think it's something about the paring back of life, down to its simplest components. Gorgeous post, gorgeous pictures. Congrats you crazy kids. Love this lovely post on love. A perfect way to start the day! I have been dying to take Andrew camping (for his first time!) and this appears to be the perfect spot. Did you rent a site or just find a spot? This looks amazing! Such a gorgeous lake, and gorgeous pictures! I think it's amazing that you have been with/known sean for so long. Ahhhh... Perfect. Love it when that happens. Happy anniversary, you two. Sniff. Isn't it wonderful when that happens? Next weekend, I'm going to an alumni weekend at a summer camp in the Sierras where I worked during most summers in the 80s, and which my children now attend. I wonder if it'll be how I remember? This is such a beautiful post! You really have a gift for words. Also, I love Sean's Vandelay Industries shirt--I must have one! What a beautiful spot, and how wonderful to have found it so much like you remembered. Amy: You don't have to rent or reserve a spot -- you can just camp wherever you want. You do have to get a permit ($9), which you can either get online in advance, or just pick up at the ranger station when you drive in (we did the latter.) It's fairly primitive (you have to dig your own firepit, there are no toilets or shower blocks -- well, there are a few portapotties, but they tend to be at the more established camping areas closer to the entrance, where the RVs are) but if you don't mind a little roughing it, it's perfect. Wow, Holly. The photos, done in that retro style, made me feel like I was looking at family pictures of someplace I'd actually been. How cool. Camping hint: Best thing ever invented with regards to living rough? Baby wipes! Easy to carry (you can even put a stack of them in a ziploc baggie if you don't want to carry the whole container). Clean all the important areas without leaving the tent, and throw them on the campfire when you're done. Voila! Oh, be still my beating heart. You two are the bee's knees. Emerald? Is my computer distorting the pictures? I was stunned by the vibrant BLUE color. Incredibly blue, so much that it looks fake, like someone dumped food coloring in it. Or like this stuff I used to have to dump into my fish tank to treat them for something or other. Made the water bright blue for a while. Jaxx: The weird thing is that it alternately looks blue AND green! When you first see it from the road, it's more green and shimmering, but then at other times (changing light, I guess?) it's way more blue. Hmm, perhaps emerald still wasn't the right word, you're right! Aquamarine, maybe? It's the craziest thing how it changes. And I should probably admit that the Instagram filter on a couple of the (square) pictures bumps up the saturation a few notches. Not much, though -- it really is that gorgeous in real life. Very sweet. :) I just realized the same thing this year... I'll be 36 and my BF and I started dating a week before I turned 18. We have a few memorable places like that, too. "Remember how fun/cool/gorgeous that was?" Oh, I loved this post. I always love hearing about your travels and this one felt extra special and spontaneous and you both look so happy! Holly, a lovely piece of writing, and made me want to light out for the territories too. Lucky in that I get to do that occasionally, and when there's little time, Big Sur is only a bit more than an hour away. Thanks for painting a picture. Pics and text are awesome, all! You're looking awfully cute in that straw hat, Holly. BTW -- may I just say you two are going to have beautiful children? Well, I just did. And you are! Heh heh. It helps that they're tears of joy, natch. Congrats to you and Sean, you guys are awesomesauce. And that lake is freakin' gorgeous! LOVED this post. Made me tear up a bit, and reminded me of all the places I need to visit again. what a fitting tribute to spending half your life with someone! think of all the lovely places you can visit over and over throughout your lives together? each time will be made special again because you're with the other. this place looks positively magical. i need to drag jon away to the mountains and lose cell reception, absorb nature. I have known my husband for 15 1/2 years. We have now spent over half our lives together :) It is fun having a shared history and since we still live in the same area we grew up in we still have a core of friends that have been along for the ride and now we have little ones to drag along with us. We all take a yearly vacation together to the same spot so we definitely are building layers of memories with the same background. Its nice getting that flash of nostaliga coupled with the opportunity to make fresh memories. This is beautiful Holly, and it makes me so glad that I get to read your words. This looks absolutely gorgeous and just perfect. I LOVE that photo of you in your fedora--one of my favorites. New Avatar? Love the photos, especially the first one. The blue waters brings a calming effect. I could just stare at it for hours and I feel so relaxed. Did you use a camera filter? The images have a yellow hue. Aw Holly Burns. Maybe it's that I've just had a super great day, or maybe that I've grown quite fond of this blog since being directed to it by a friend who said your recaps of the Bachelor were outstanding (they were/are...) back in '06, but your last lines made me tear up. It's so true, and you could not have written it more perfectly or poetically. Thank you. A (stranger appropriate) hug from Portland.